The Digipool Digital Pool Table is available for rental, to the commercial market only. This amazing pool table with digital games and contactless payment will prove popular with customers and owners alike. The Digipool is an English pool table using 2” balls as standard, with a one piece slate bed, available in 6ft and 7ft sizes. It comes with a contactless payment system for easy commercial usage, as well as the standalone unit or wall unit to control the games. The Digipool digital pool table is available exclusively from Home Leisure Direct in the UK. This amazing digital pool table is available for rental in the UK only through us. What makes this pool table special? Hingeless Frame - Standard pub-style tables employ a hinge along one side meaning the cushion is "floating" above the slate. This table has the top rail come as a seperate piece, allowing it to be uniformly fixed to the table's main body, delivering consistent performance from every cushion. Chrome Metal Corner Caps and Feet - Some pool tables come with plastic corners and feet which diminish the quality of the table in comparison. This table comes with chrome metal corners and feet which protect the table and make it look stunning. Noise-Reducing Ball Return Box - Some customers have told us that the ball return on other tables can create an echoing noise when the balls arrive in the box at the end of the table. To eliminate this, we use high-grade foam to deaden the noise experienced when the balls come to rest in the ball return area. Aramith Balls - Many tables at this price will be supplied with cheaper balls as standard, which don’t look as good or play as well as you’d hope. As well as the microchipped balls for Digipool play, we include a set of Aramith reds and yellows balls as standard. Aramith pool balls are used in 98% of the world’s pool tournaments. Tournament Pocket Profiles - This table is made to tournament specifications, including the pocket profiles. This makes it perfect for tournament and league play. Forget everything you thought you knew about pool. Digipool is different - really different! We’ve dragged pool into the 21st century and made it digital to give you a variety of games for groups of 2-16 people. What better way to catch up with a group of mates than with a drink and a game of ‘Killer’, or target your colleagues after work with a game of ‘Torpedo’? Whenever, or however, you like to socialise, Digipool has a game for you. Come try out our new tables & play pool like never before! Digipool is a new concept which combines the traditional game of pool with computer gaming, using patent pending technology. The complete package consists of a pool table embedded with sensors and custom-developed microchipped balls, all connected to a large touchscreen computer with which players can interact. There are new fun interactive games which will draw customers to hospitality venues, retain them longer and ultimately increase revenue for the venue. Torpedo: a new, exciting multiplayer game which brings out the competitive edge in players and allows them to target players to blow up. Each player has a battleship and starts on 30 points. When it is a player’s turn they select another player on the touchscreen to target and if they pot a ball, the chosen ship is hit by the value of that ball. Win by blowing up all the other ships! Who will be the last ship floating? Killer: another multi player game where players stay alive by potting a ball on their turn! Miss a shot, lose a life! Pot the black, gain a life. Lose all 3 lives and the character will be blown up and it is game over. The last person standing is the winner! Traditional Pool: The classic game of 8-ball pool, brought into the 21st century by allowing players to see which balls have been potted and which remain on the table. In addition, there are leagues and ‘winner stays on’ functionalities which will take away the hassle of keeping score or fighting over whose turn it is! For use in a commercial setting, the Digipool is available for rental only. If you are looking to rent the Digipool for your commercial premises, please contact our Commercial Sales Team on 0800 622 6464 or 01454 413636 for pricing based on your requirements. For our range of contactless pool tables, please see our contactless pool tables section. Our contactless pool table solutions are already up and running in locations around the UK, and operators are discovering and benefiting from the excellent versatility offered by this new payment system. Check out the videos above to see how our Signature contactless pool tables fit seamlessly into a commercial environment. If you fancy checking out one of these fantastic Digipool Pool Tables in the flesh, then pop into our showroom in Bristol for a full demonstration. We have ours on display and ready for a game, so come and challenge one of our staff and see how much fun the games are. English Pool - played with reds and yellows, or the special microchipped Digipool pool balls. This pool table is supplied with professional grade 6811 pool cloth made by Strachan. 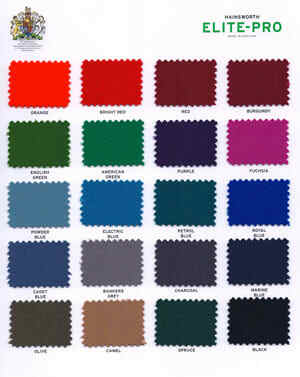 Strachan 6811 cloth is premium grade, fast, match quality pool cloth. 6811 cloth offers good control and response, and is treated with SpillGuard to protect against stains and spills. As well as the special microchipped Digipool balls, this pool table is supplied with one set of Aramith balls as standard. Also included are two sets of standard reds and yellows balls. As the UK's leading pool table retailer, we are delighted to offer a full warranty throughout the rental period with all of our Contactless Pool Tables. Usually these pool tables are held in stock and can be delivered in 1 to 3 weeks depending on availability of the cloth from from the manufacturer, your location and availability. If stock is not available then it will be made to order which will take approximately 4 to 1 weeks.